Eye On Tampa Bay: Where in the world is Senator Bill Nelson on ObamaCare Now? 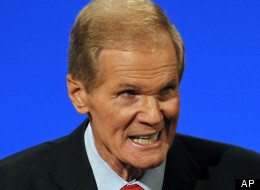 Where in the world is Senator Bill Nelson on ObamaCare Now? In 2010 when a majority of Floridians and Americans opposed ObamaCare, Senator Bill Nelson went against his constituents and voted for it. Now that we are finding out "what's in it", more Americans oppose ObamaCare today than when it was passed. But where is Senator Nelson? Surely he knows the latest polling. Support has dropped in virtually all demographic categories, but it has fallen the farthest among two core Democratic groups – women and Americans who make less than $50,000. The mainstream media continues to focus their attention on the Republicans who are somewhat divided on just what to do about ObamaCare and anything else. The Tea Party conservatives want to defund ObamaCare in any upcoming budget resolution while the moderates and the GOP leadership is conflicted all over the place, fearful of being blamed for a government shutdown. The conservatives aren't advocating nor want a government shutdown – that's a mainstream false narrative from the Democrat party. Conservatives will work to pass a budget resolution - they just don't want ObamaCare funding to be part of it. The onus and responsibility then is solely on the Senate Dems and Obama to either fund the rest of the government or the Dems and Obama shut the government down because they won't stop the job destroying ObamaCare train wreck. Let's get back to our own Senator Nelson. He and we both know the many issues associated with the implementation of ObamaCare. Have you heard of Senator Nelson being asked if Obama can constitutionally and unilaterally delay the employer mandate? Crickets. A call to Nelson's Orlando office yielded an answer from an aide named Rupa that Obama could constitutionally delay a part of a law he signed because it was “procedural” due to employers not being ready. Really? However, when pressed about delaying the individual mandate because the government's not ready either, she said the individual mandate should not be delayed. Huh? "The reason we are bringing this legislation forward is because there is a gaping hole. We know that having self-attestation for getting these taxpayer subsidies in these exchanges is going to lead to an incredible amount of fraud. We are even having estimates of as much as $250 billion worth of fraud that could be going into this program." Meanwhile, the White House is arguing that the so-called Obamacare data hub, the system of information users will enter when applying for health insurance subsidies, is "ready for operation." But as former Social Security Administration commissioner Michael Astrue testified to the House Homeland Security committee Wednesday, there are significant concerns with regard to security and privacy that the Department of Health and Human Services has not answered. Nelson knew ObamaCare would decimate and eliminate Medicare Advantage, especially for so many of his retired constituents in the more heavily Democrat districts of South Florida. So we remember Nelson's own ObamaCare GatorAid backroom deal. It's exposed in the video below and was part of all the other corrupt, crony deals the Democrats negotiated behind closed doors to ram ObamaCare through. Gator Aid: At the request of Sen. Bill Nelson (D-Fl), the Senate bill includes a formula for protecting certain Medicare Advantage enrollees from billions in cuts. The formula would only apply to five states, most notably to Florida in which 800,000 of the state's one million Medicare Advantage users would be exempt from cuts. Eliminating government duplication and reducing waste and fraud plaguing programs like Medicare. Reducing fraud plaguing programs like Medicare. Regarding ObamaCare: "The law’s not perfect. But he thinks we should focus now on fixing the law and not on repealing it." Nelson wrote on his campaign website that the health care reform passed wasn't perfect, but was necessary because "the system was broken and we had to do something. A Mason-Dixon Florida poll indicated that the measure was opposed by a majority of those surveyed, and by nearly two-thirds of Florida voters aged 65 or older. But there is irony with Senator Nelson. The Tampa Bay area has been almost ground zero for tax identify theft so Nelson is again backing legislation to crackdown on the $5.2 billion crime. He's sponsoring the bill. OK. Well the security in the ObamaCare application where taxpayer identification and other personal information is entered is in question and it has not gone through strenuous and thorough testing before the October 1 launch. The ObamaCare Navigators who will be navigating to “help” folks sign up for ObamaCare do not have background checks. Can you square up Nelson sponsoring identify theft legislation with his seemingly unconcern with the ObamaCare security issues? Earlier this year Nelson signed on to back a plan to raise the cap on rewards for people who report Medicare fraud from $1,000 to $9.9 million. Announced in April, the draft rule change also seeks to speed up payments to whistle-blowers who have helped the Centers for Medicare & Medicaid Services (CMS) to recoup almost $15 million in fraudulent Medicare funds since 2010. We doubt Nelson would do this if he didn't think Medicare was fraught with fraud. So how does he thread the needle of the ObamaCare application not having a solid verification system in place when it launches next month? In other words, an invitation for more fraud and waste! There you have it. Nelson admits he had to vote for ObamaCare because “the current system was broken”. But now he and we see that what he voted for is worse. He has admitted ObamaCare is flawed and the very law he voted for “needs fixing”. But where in the world is Senator Nelson now on ObamaCare? What fixes is he proposing as we watch the negative impact in Florida? Silent and Missing In Action. We heard nothing from the Senator during the August recess. We've heard no proposals from Nelson on how or what he proposes to fix the ObamaCare train wreck. It's time he is held accountable for his ObamaCare vote which went against the majority of Americans and his constituents in Florida who opposed it. Nelson is trying to push a square peg down a round hole as he supports legislation to stop Medicare fraud and ID theft at the same time he supports inviting more fraud and ID theft with ObamaCare. You simply cannot have it both ways. The media's focus and fascination only on where Republicans stand on the ObamaCare train wreck is disingenuous. Why isn't our media asking those who voted for it, like Senator Nelson, what they think of ObamaCare now that it's warts have been exposed. Does Senator Nelson now believe Americans must suffer the negative consequences of ObamaCare before he will speak up? Why isn't our media asking Nelson what his proposals are for fixing the ObamaCare “train wreck” or whether he even cares? Sadly, don't hold your breath. The mainstream is either uninterested or refuses to even question, much less hold accountable, Democrats like Senator Nelson who voted for the ObamaCare train wreck. Stop the Lies, everybody in the US wishes for medical coverage. Sure everyone wants medical coverage, and lots of things. Everything we stated here is cited in fact. Keep on wishing... maybe it will come true. But I suggest coming up with another plan other than wishing. Senator Bill Nelson is a liar. His own office states that they have had over 400,000 complaints from Floridians who have lost their coverage or have skyrocketing insurance premiums. His own office says that he "doesn't have time" to call them back. Rather, he sends them an offensive email that says that only a "small number" of people have had their policies cancelled and that it is because Obamacare has "higher standards." Senator Bill Nelson is an embarrassment to the quality people we have here in Florida, and it's time for him to apologize and do what's right.